Live Vows™ is currently offering our Full Service and Premier Wedding Webcasts at most destinations in Northwest Florida. Browse the information below to see what is included in our Full Service and Premier Wedding Webcast Packages, how much it costs, and what enhancements are available to customize your wedding webcast. To see samples of a webcast video, dedicated webcast pages, and custom enhancements, please visit our Demo Section. A wedding webcast page on LiveVows.com. We'll send you a link to your dedicated page when your reservation is confirmed. That way you can post it on your wedding website or blog as early as possible. Your webcast page will also be active for a minimum of 30 days after your wedding. This can be extended to six or twelve months by purchasing the extended webcast archive enhancement. Check our Demo Section to see an example of what a webcast page looks like. A professionally trained and courteous staff member will be on-location during the ceremony to webcast your wedding. We'll take care of everything, including consulting with your wedding coordinator before the wedding. A live, broadband-quality webcast of your ceremony, up to two hours in length. The audio and video will be very good, and the stream will be configured so that anyone with a broadband connection can watch your wedding webcast. Check our Demo Section to see an example of what a webcast video looks and sounds like. Unlimited viewers! We have no restrictions on how many total or simultaneous viewers can view your wedding webcast. Invite as many people as you want! We archive your wedding webcast for 30 days of online-viewing. If you would like the archived video to remain available longer, we recommend purchasing the six month or twelve month enhancement. Check our Demo Section to see an example of what an archived webcast video looks and sounds like. Webcast Report emailed to you after the wedding that shows how many connections there were to your wedding webcast. Bonus! For a limited time, we will provide you with a DVD Copy of the Wedding Footage for FREE! The raw video footage of your wedding is provided in DVD format (standard definition for television) and is packaged in a professionally-designed DVD jewel case with insert that includes the couple's names, wedding date and screen grab of the wedding cermony. This is a $300 value and is only available as a free bonus for a limited time. * Please see important note below. We can send professionally designed HTML Email Invitations to your online guests. Email Invitations will include links and instructions for viewing the wedding webcast. We will send the Email Invitation one month before the wedding date and again as a reminder one week before the wedding date. All you have to do is send us your list of email addresses. We'll take care of the rest. Check our Demo Section to see an example of what an email invitation looks like. Custom messages and/or photos from the bride and groom can be included for an additional fee. Add a virtual guestbook to your wedding webcast page. Viewers will be able to post comments and share their thoughts and wishes for you. Check our Demo Section to see an example of what a webcast guestbook looks like. The raw footage of your wedding can be purchased if you wish. We will provide the raw footage to you on DVD. The footage is recorded by high-quality 3ccd digital video cameras at full television resolution. It is important to note that the footage is completely untouched and unedited. However, it makes great b-roll footage if you have someone putting together a wedding video for you. NOTE: Please let us know ahead of time if you want to purchase the raw footage so we can make special preparations during setup of the webcast. We can extend the live webcast up to 30 minutes after the conclusion of the ceremony. This will give you and members of your wedding party a chance to step in front of the camera and send personal greetings and messages to your online guests. Most of the time, there will be great opportunities to do this during or after the posed photo shoots that often follow a ceremony. It is important to discuss this option with your wedding coordinator if you choose to add it to your webcast package. We can add links for online gift regitries for up to ten stores or websites. It's a very convenient way for your wedding webcast guests to view your wish list and send a gift. Check our Demo Section to see an example of how we link to your online gift registries. Increase the amount of time your archived webcast is available for online-viewing after your wedding! 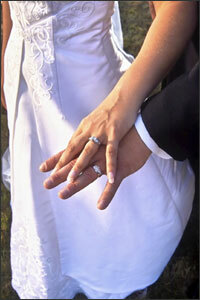 All packages include 30 days of online-viewing of your archived wedding webcast. This can be increased to six months for $100 or twelve months for $150. This enhancment also includes extending the amount of time your dedicated webcast page is active. Two-Camera View will be available soon! Guestbook Cam will be available soon! Reception Cam will be available soon! We provide the raw footage of your wedding webcast to you on DVD that will play in most standard DVD players. The footage is recorded by high-quality 3ccd digital video cameras at full television resolution (standard definition). It is important to note that the footage is completely untouched and unedited. However, it makes great b-roll footage if you have someone putting together a wedding video for you. WE RECOMMEND THAT YOU STILL HIRE A PROFESSIONAL VIDEOGRAPHER FOR A TRADITIONAL WEDDING DVD. See our FAQ's for more info on why we recommend hiring a videographer.